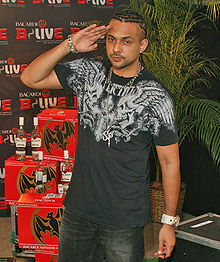 Sean Paul at the B-Live concert in 2007. Sean Paul was born in Kingston, Jamaica, to parents Garth and Frances. His mother is a painter. His paternal grandfather emigrated from Portugal and his paternal grandmother was Afro-Jamaican; his mother is of English and Chinese-Jamaican descent. Sean Paul was raised as a Catholic. Many members of his family are swimmers. His grandfather was on the first Jamaican men's national water polo team. His father also played water polo for the team in the 1960s, and competed in long-distance swimming, while Paul's mother was a butterfly swimmer. Paul played for the national water polo team from the age of 13 to 21, when he gave up the sport in order to launch his musical career. He attended Wolmer's Boys' School and the College of Arts, Science, and Technology, now known as the University of Technology, where he was trained in commerce with an aim of pursuing an occupation in swimming. In 2012, Paul married his longtime girlfriend Jodi Stewart, a Jamaican TV host. In August 2016, it was announced that the couple was expecting their first child. On 26 February 2017, Sean Paul announced the birth of his son, Levi Blaze. Manager and producer Jeremy Harding heard about Sean Paul[when?] when Harding's brother told him about seeing someone at a small open mic event in Kingston who sounded a lot like the dancehall DJ and toaster Super Cat. Harding eventually met the singer when Paul came by his studio to ask for some advice. During the meeting Paul recorded a vocal over Harding's rhythm track and in the process created the song "Baby Girl". Paul began hanging out at the studio every day, and the pair collaborated on several more tracks. When they recorded "Infiltrate" they decided they had something good enough to get on the radio. As Sean Paul started to attract local attention, Harding began looking after his affairs. He later told HitQuarters that his support of Paul's fledgling career initially led him assuming the roles of "DJ, manager, road manager and security guard." Paul made a cameo appearance in the 1998 film Belly on stage performing. He made a successful collaboration with DMX and Mr. Vegas, "Top Shotter", to the soundtrack of the film. In 2000, Paul released his debut album, Stage One with VP Records. In 2002, Sean Paul continued his work with manager/producer Jeremy Harding, and after a joint venture deal with his label VP Records and Atlantic Records, announced the release of his second album, Dutty Rock. Pushed by the success of the singles "Gimme the Light" and the Billboard Hot 100 topper, "Get Busy", the album was a worldwide success, eventually selling over six million copies. The album Dutty Rock won the Reggae Album of the year at the 46th Annual Grammy Awards in 2004. "Get Busy" was also nominated for best Rap Song in that year. Simultaneously, Sean Paul was heard on Beyoncé's U.S. #1 single "Baby Boy" and Blu Cantrell's "Breathe", a chart hit in Europe. Both helped to push his reputation further still in the United States. He appeared on Punk'd, 106 & Park, Sean Paul Respect, Making the Video ("Get Busy", "Gimme the Light", and "Like Glue") and his music videos have been broadcast on MTV and BET. Paul's third album The Trinity was released on 27 September 2005. The album produced five big hits, "We Be Burnin'", "Ever Blazin'", "Give It Up to Me", "Never Gonna Be the Same" and the U.S. chart-topping smash hit "Temperature". The video of "Give It Up to Me" (featuring Keyshia Cole) was featured in the film Step Up in 2006. He was nominated for four awards at the 2006 Billboard Music Awards, including male artist of the year, rap artist of the year, hot 100 single of the year, and pop single of the year for "Temperature". He also won an American Music Award for "Give It Up to Me" beating Kanye West and Nick Lachey who were also nominated for the award. "Send It On" from The Trinity featured on the 2005 Vauxhall Corsa advert. Sean Paul often contributes his songs to various Riddim Driven albums by VP Records. In March 2007, he returned to Jamaica to perform at the Cricket World Cup 2007 opening ceremony. Paul appears in the video game Def Jam: Fight for NY as part of Snoop Dogg's crew and again in the game's sequel, Def Jam: Icon. Imperial Blaze was released on 18 August 2009. The lead single, "So Fine", which was produced by Stephen "Di Genius" McGregor, premiered on Sean Paul's website on 26 April 2009. The album consists of 20 tracks including "So Fine", "Press it Up", "She Want Me", "Private Party" which are party tracks and also love songs such as "Hold My Hand" (feat Keri Hilson), "Lately", "Now That I've Got Your Love" among others. Producers on the album include Don Corleone, Jeremy Harding, and Sean's brother Jason 'Jigzagula' Henriques. All the songs of the album have been added to Sean Paul's Myspace page on the day of release of the album. The album spawned eight music videos: "Always On My Mind (with Da'Ville)", "Give It to You (with Eve)", "Watch Them Roll", "Back It Up" (with Leftside), "(I Wanna See You) Push It Baby" (with Pretty Ricky), "Hit 'Em" (with Fahrenheit and his brother Jason "Jigzagula" Henriques), "Come Over" with Estelle, and also the video of his first single, "So Fine". 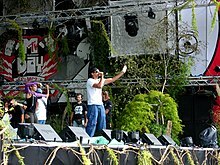 Sean Paul appeared in Shaggy's video, "Save A Life", which also includes appearances from Elephant Man and Da'Ville, among others. In an effort to raise money for a children's hospital, Shaggy, Sean Paul and others had a benefit concert. All proceeds went towards getting new equipment and technology 'For Aid to the Bustamante Hospital for Children'. During the premiere for MNET's Big Brother Africa: All-Stars on 18 July 2010, he performed his songs "Temperature", "Hold My Hand", and "So Fine". Sean Paul performing at B96 Summerbash 2012. The first single "Got 2 Luv U" features vocals from American singer Alexis Jordan. It was released on 19 July 2011 by Atlantic Records. The song was written by Sean Paul, Ryan Tedder and Stargate and produced by Stargate. "She Doesn't Mind" is the second single from the album. It was written by Sean Paul, Shellback and Benny Blanco and was produced by Shellback and Benny Blanco. It was released on 29 September 2011 on NRJ and Skyrock (French radios), and to iTunes on 31 October. Like its proceeder, "Got 2 Luv U", it topped the charts in Switzerland, but it debuted at that spot. Sean appeared on the Never Mind the Buzzcocks episode which aired on 21 November 2011. Tomahawk Technique was released on 18 September 2012 in the U.S. The album was nominated for the best reggae album in the 55th Grammy awards. Sean Paul is featured in the Simple Plan song "Summer Paradise". In 2012, Sean Paul was asked to team up with electronic artist Congorock and Moombahton artist Stereo Massive to feature vocals on their song "Bless Di Nation". Sean Paul (second from left) speaking at the 2015 United Nations Climate Change Conference. During 2013, Paul worked on his sixth studio album Full Frequency, which was released on 18 February 2014. The first single on the album, "Other Side of Love", was released to iTunes on 10 June 2013. The second single, "Entertainment", which features 2 Chainz and Juicy J, was released on 25 June 2013. Paul released the official remix to "Entertainment" on 3 September 2013 with an additional feature from Nicki Minaj. "Turn It Up" was released as a single in the UK on 20 October 2013. It was to be released in Germany on 22 November 2013. "Want Dem All" was released as a single in the U.S. on 5 November 2013. The album features guest appearances from Damian Marley, Iggy Azalea, Brick & Lace, Konshens, Nicki Minaj, 2 Chainz and Juicy J. Also in 2013, Paul was featured on the single "What About Us" by British girl group The Saturdays. The single went straight to the top of the Official UK Charts with over 100,000 sales in its first week, becoming the fastest selling single of the year at the time of release. In January 2014, Paul was the main international artist at Fiestas Palmares 2014 in Costa Rica. Also in 2014, Paul was featured on the official English-language version of long-running Latin American chart topper "Bailando" by Enrique Iglesias featuring Gente de Zona and Descemer Bueno. The video for the English version was shot concurrently with the video for the Spanish version in Santo Domingo. The English version reached top 10 status in the United States and topping the charts of several other countries. 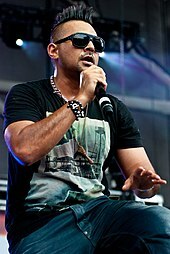 Sean Paul appeared on the Apocalypse Soon EP by electronic group Major Lazer, on the track "Come On to Me", which was released as the second single from the album, after "Aerosol Can", a collaboration with Pharrell Williams. He also collaborated with Nigerian recording artist Timaya on a remix of his song "Bum Bum". An accompanying video directed by Shutah Films was released online on 11 April. The album was also nominated for Best Reggae Album at the Grammy's in 2015. But, in September 2014, Sean Paul confirmed that he had left Atlantic Records and will become an independent artist. On 6 July 2015, Paul released the music video for his song "Take It Low" on the album Full Frequency. Sean Paul enjoyed a commercial resurgence in his career throughout 2016 after being featured on three largely successful hit singles by Australian singer Sia, girl band Little Mix and classical crossover group Clean Bandit. On 6 February 2016, Paul performed in the opening ceremony of Pakistan Super League. On 11 February 2016, Sia released a remix version of her song "Cheap Thrills" featuring Paul. The song became an international hit, reaching number one in more than 15 countries, including the United States, Canada, France, Germany, Italy, Spain and Sweden. On 11 April 2016, it was confirmed that Paul would be featured on a track by Little Mix called "Hair", from their third album Get Weird. In June 2016, he signed with Island Records. In November 2016, Paul cited Toots and the Maytals as inspiration when it comes to his own personal career longevity by saying, "I've seen some great people in my industry, you know, people like Toots... Toots and the Maytals. Toots he's a great reggae artist and he’s still doing it... He's up there in years and he's doing it. Those kind of artists inspire me. I know I'm just going to keep on doing music as long as I can." In October 2016, Clean Bandit released the song "Rockabye", which features Paul and English singer Anne-Marie. It spent nine consecutive weeks at number one of the UK Singles Chart, and gained the coveted Christmas number one. On 18 November 2016, he released "No Lie" featuring Dua Lipa, which served as the lead single from his EP Mad Love The Prequel. ^ "Sean Paul Bio | Sean Paul Career | MTV". Vh1.com. 1973. Retrieved 18 February 2014. ^ "Sean Paul". Top40.about.com. Archived from the original on 4 May 2014. Retrieved 18 February 2014. ^ "Sean Paul". Somethingjewish.co.uk. 13 February 2004. ^ "A Yiddisher Rasta man". Ynet.co.il. 5 April 2009. ^ "Photos: Sean Paul And Wife Jodi Celebrate Wedding Anniversary In The Bahamas". 3 June 2016. ^ "Jodi "Jinx" Stewart-Henriques Sean Paul's Wife". ^ "Sean Paul And Wife Jodi Expecting First Child". 24 August 2016. ^ "Sean Paul is a first-time father". BelfastTelegraph.co.uk. Retrieved 1 March 2017. ^ a b c "Interview with Jeremy Harding". HitQuarters. 4 September 2003. Retrieved 6 October 2011. ^ "New Music: Sean Paul – 'So Fine'". All Sean Paul. 25 April 2009. Archived from the original on 4 June 2009. Retrieved 23 February 2011. ^ "New Music: Sean Paul – 'So Fine'". Rap-Up.com. 25 April 2009. Retrieved 23 February 2011. ^ "Sean Paul: Danceul star". Bluesandsoul.com. Retrieved 23 February 2011. ^ "Sean Paul's MySpace". Myspace.com. Retrieved 18 February 2014. ^ "Sean Paul set to launch Imperial Blaze in style". ttgapers.com. Archived from the original on 17 July 2011. Retrieved 23 February 2011. ^ Chapman, Alex (21 July 2011). "Sean Paul Releases 'Got 2 Love U' Single, Taps Akon for New Album". Billboatd. Retrieved 8 August 2011. ^ "| Tomahawk Technique Album Cover & Tracklist Sean Paul | Dancehall Madness". Mydancehallmadness.com. Retrieved 18 February 2014. ^ "iTunes – Music – She Doesn't Mind – Single by Sean Paul". itunes.apple.com. 31 October 2011. Retrieved 18 April 2012. ^ "New Music: Sean Paul f/ Iggy Azalea – 'Wickedest Style'". Rap-Up.com. Retrieved 18 February 2014. ^ "iTunes - Music - Other Side of Love - Single by Sean Paul". itunes.apple.com. 10 June 2013. Retrieved 18 February 2014. ^ "Sean Paul - Other Side Of Love | New Hip Hop Music & All The New Rap Songs 2011". HipHop DX. 12 June 2013. Retrieved 18 February 2014. ^ "iTunes Store". itunes.apple.com. Retrieved 18 February 2014. ^ "Sean Paul — Entertainment (Remix) ft. Nicki Minaj, Juicy J, & 2 Chainz : Nicki Minaj". Mypinkfriday.com. 22 August 2013. Archived from the original on 27 February 2014. Retrieved 18 February 2014. ^ "Concierto Imperial Palmares 2014 con Sean Paul". Adondeirhoy.com. 30 December 2013. ^ "Pharrell, Sean Paul & More Appear On Major Lazer's "Apocalypse Soon"". The Source. 7 March 2014. Retrieved 11 April 2014. ^ "Timaya – Bum Bum (rmx) f. Sean Paul (Video)". HiphopSouth. 11 April 2014. Retrieved 11 April 2014. ^ Meschino, Patricia (11 November 2014). "After Atlantic: An Independent Sean Paul Moves Forward". Billboard. Retrieved 17 January 2015. ^ "Sean Paul". The Breakfast Club. 21 November 2016. Web. <https://www.youtube.com/watch?v=RAXhwLm3d60> Retrieved 23 November 2016. ^ Corner, Lewis (21 October 2016). "Clean Bandit team up with Sean Paul and Anne-Marie for bouncy new single 'Rockabye'". Digital Spy. Retrieved 26 November 2016. ^ Savage, Mark (23 December 2016). "Clean Bandit land Christmas number one with Rockabye". BBC News. BBC Online. Retrieved 13 February 2017. ^ "Listen to Sean Paul's new song with Dua Lipa 'No Lie' - NME". nme.com. 18 November 2016. Retrieved 17 February 2017. ^ "Sean Paul - Grammy". ^ "Sean Paul Wins American Music Award 2006". Jamcl.com. Archived from the original on 24 March 2013. Retrieved 18 February 2014. ^ "MTV Video Music Awards Japan 2012 Winners". Jpopasia.com. Retrieved 18 February 2014. ^ "Sean Paul gets MOBO reggae Award". Jamaicaobserver.com/. Retrieved 18 February 2014.